Every tourist visiting Nepal requires a Visa and there are two ways of getting one..
Because of reasons stated below, it is a pretty good idea to have one before travelling, it will certainly save you time upon arrival at Kathmandu Airport. In the UK these can be obtained by visiting the Nepalese Embassy in London. Details are..
Visit their Web Site http://www.nepembassy.org.uk/ and go to the Visa section. 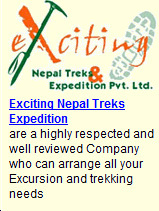 The Web Site contains much more useful information on visiting Nepal. Note - If you go to the Nepalese Embassy in London for a Visa, processing takes 24 hours. 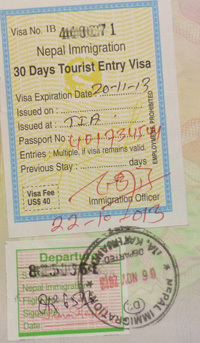 Airlines will usually give you the Visa Application Form at some stage during your Flight. The form will ask you where you are staying so it's a good idea to have all your Holiday details within easy reach (also have a Pen handy as well!!). The procedure upon arrival at Tribhuvan International Airport is quite tiring I have to admit. Basically you have to join the Queue to see the first person who will inspect your Visa Form, he or she looks at it along with your Passport and you then join another queue to have it processed by three other persons, each one having their own part of the operation to complete. The whole thing for me took over an hour. Remember, you're standing in a queue for that time after sitting down on a 16 hour flight with changes and suffering from jet lag at the same time. The secret is....be patient ! 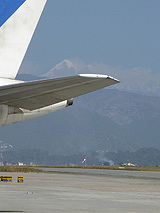 If you are going by Plane to any other City in Nepal or even on the Everest Mountain Flight, you will always need to show your Passport with Visa upon departure and landing.